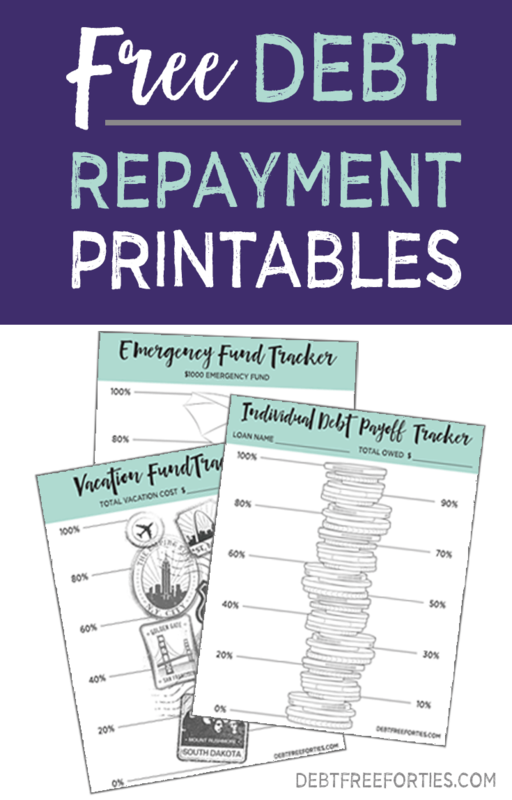 FREE Debt Repayment Printables Just for You! Whether you’re new to setting financial goals, or you’ve been around the debt cycle before, you know how difficult it can be to stay on the path. I like to say that I’m like a bird or a small toddler – I see something shiny and get easily distracted. 😉 Add a husband into the mix with a different mindset, and it’s no wonder we were all over the place financially! By having debt repayment printables posted in a central location in our house, we had a daily reminder of what we were working towards. This made all the hard choices (like working extra hours and choosing not to eat out) easier when I was reminded why we working so hard. Seeing the progress and having a daily reminder really kept us really focused. We have been able to not only pay off several debts, but keep items like credit cards paid off because these reminders are there every day, helping to make the hard choices easier. Since we’ve began using these printable graphics to track our journey, we’ve paid off over $12,000! These fun and imaginative graphics will help keep you on track with your debt repayment and savings goals while lookin’ pretty. Stylish and functional – just like us, right? Just download the PDF, print them out, and put them up in a spot where you’ll see them every day, like your kitchen. You’ll be hitting your financial goals in no time! I hope they give you a little bit of joy on a sometimes difficult journey.